Six of the best options for portable gaming on a budget. Once upon a time, laptops for gaming were known to be gigantic beasts that struggled to run modern games without overheating. They were clunky, noisy, and worst of all, really expensive. Luckily for students and gamers on the go, times have changed. Gaming notebooks are now more portable and accessible than ever. We set out to find decent budget laptops for gaming—all coming in under and around the $1000 mark. Have a more generous budget? Head over to our guide to the best gaming laptops. On this quest to find budget laptops for gaming, we came across countless machines equipped with Intel or AMD integrated graphics. It isn’t difficult to find one of these notebooks under $600, but the gaming performance will leave much to be desired, particularly if you have any plans to play any modern games. We decided if it can't play a handful of recent games even at lower resolutions and the lowest graphic settings, it can't be considered a gaming laptop. Fortunately, we were still able to find several great notebooks with discrete graphics cards that fit our criteria. Here's a list of our top choices for the best budget friendly gaming laptops. Priced at $849, the Legion Y530 features Intel's Core i5-8300H, Nvidia's GeForce GTX 1050 Ti, a 128GB SSD + 1TB HDD and 8GB of DDR4 RAM. Aside from those internal components, the $849 Y530 offers the same lovely features as its $1500 counterpart. This includes: ultra thin bezels, Harman speakers with Dolby Audio, full-sized white backlit keyboard, exceptional cooling and all around killer looks. $850 may be enough to get you a fairly decent gaming desktop, but if you're looking for an all-in-one laptop in that range with balanced gaming performance and portability, Lenovo's Legion Y530 might be a perfect fit. With a PCMark score of 4608, the Y530 proved itself more than capable for everyday computer tasks and more. 3DMark Fire Strike produced scores up to 6598, barely falling short of a desktop GTX 1050 Ti alternative. If you're looking for a machine to run the newest games like Black Ops 4, Assassin's Creed Odyssey or the upcoming Battlefield 5 at glorious 60 or higher FPS, you may have to tweak some settings on the Legion Y530. But for just about every older classic and multiplayer hit, this laptop is definitely more than sufficient. Acer's Predator Helios 300 offers an incredible value proposition. At just over a grand, sometimes less if you can find it on sale, it offers a GTX 1060 6GB graphics card that can lock down 60 fps at near-max settings in most games from the last few years. The system's lacking in any fancy screen features like a high refresh rate or G-Sync, and you'll probably want to think about investing in a large HDD to back up the 256GB SSD. But those minor issues don't mean much when you factor in the super-affordable price tag. The Acer Predator Helios 300 tops our list as the highest performance gaming laptop with a budget that won't break the bank. It's priced around $200 more than our overall top pick, the Lenovo Legion Y530, but the Helios 300 does a great job playing even the newest games on high settings. If you just want great gaming performance for $1000, look no further. Of all the budget gaming laptops we've tested, Acer's Nitro 5 is one of the bulkiest and heaviest. It may not be the prettiest of the bunch, but the AMD-powered Nitro 5 might just offer the best gaming performance per dollar. Intel may have cornered the gaming laptop market with its efficient and powerful CPUs, but AMD's mobile RX 560X could make a convincing argument to go with a Ryzen system. If you're looking for pure gaming performance and don't care much about vanity or quality of life features such as thin bezels and lightweight construction, Acer's AMD Ryzen powered Nitro 5 is a great option. It did fantastic in all of our benchmarks and offered some of the best performance in modern FPS games for any laptop we tested under $700. The MSI GF63 8RC is by far the lightest budget gaming laptop we've tested. Priced as low as $649.99 on sale, the GF63 comes equipped with Intel’s i5-8300H, 8GB of DDR4 RAM, Nvidia’s GeForce GTX 1050 and one of the thinner bezels we’ve seen in this price range. The only obvious downside is the lack of an included SSD. The laptop comes loaded with a 1TB HDD which means you’ll probably want to upgrade the storage fairly quickly. If there's one feature we never would've expected a budget gaming laptop to have, it's a high refresh rate display. 120Hz and 144Hz panels are hard to come by in the budget space. They're typically reserved for premium notebooks well over $1000, but MSI's GL63 8RC from Walmart has one for as little as $689 on sale. The GL63 is noticeably larger and heavier than the GF63 we reviewed previously, but it's still easy to recommend here thanks to its great performance and upgradability. Adding another stick of RAM and an SSD would instantly transform the GL63 from a budget gaming laptop to a premium one. If you're used to a high refresh rate display while gaming on your desktop, the GL63 is a great way to preserve some of that glorious desktop experience. On the other hand, if you're perfectly fine with a 60Hz display, the GF63 would probably be a better fit at this price. Available for just $599 from Amazon, the Acer Aspire E 15 features Intel’s Core i5-8250U, Nvidia’s GeForce MX150, 8GB of DDR4 RAM and a 256GB SSD. It’s easily one of the cheapest laptops you can find equipped with the discrete MX150 and even comes with a decent sized SSD. Although Acer doesn’t specifically market it as a gaming laptop, we found it offers more than enough for simple gaming on a tight budget. The Acer Aspire E 15 certainly won’t compete with a budget gaming desktop, but it easily outclasses all laptops with integrated graphics. Equipped with Nvidia’s MX150, the E 15 held its own in all of our benchmark tests, scoring 3223 in the 3DMark Fire Strike test at 1080p. That’s nearly triple the score of laptops we’ve tested with Intel’s integrated UHD 630. 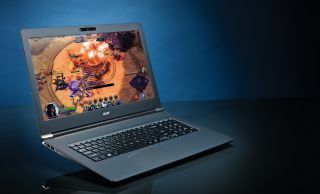 As far as budget gaming laptops are concerned, Acer's Aspire E15 is one of our top choices as the lowest barrier of entry. What makes one laptop more attractive than another in the eyes of a gamer? Is it light weight, for portability in between LAN parties? How about high-end hardware to facilitate the fastest frame rates? Surely connectivity matters. External displays, gaming peripherals and direct-attached storage can make you forget you’re even using a notebook. Or maybe value is what matters most. For a low-enough price, we’re all willing to compromise on graphics quality, right? Right? Of course not, which is why the best builders cram in as much processing muscle as possible, even when money is tight. And at the top of the range, desktop-class components in mobile enclosures set new performance records with every generation. For gaming, we use the built-in benchmarks on Shadow of the Tomb Raider, Total War: Warhammer II, and Tom Clancy's Ghost Recon: Wildlands. Tests are performed at 1080p using the highest available graphics preset, with V-sync and G-Sync disabled. All tests are run multiple times to ensure that thermal throttling doesn't occur. In the event that scores drop on subsequent tests, the lower (throttled) scores are used.